Extended: Nominations for SOA Merit Award during the 50th Anniversary Celebration! 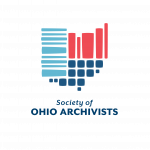 During the 50th Anniversary year of the Society of Ohio Archivists the Merit Award will be given to individuals or organizations that have by excellence in deeds, actions, or initiatives improved the state of archives in Ohio over the past year. The awards will be announced at the 50th Anniversary celebratory annual spring meeting on Friday, May 18, 2018 at the Quest Conference Center in Columbus, Ohio. * Applications are due by April 16, 2018. The award will be presented at the Society of Ohio Archivists Annual meeting on Friday, May 18, 2018 at the Quest Conference Center in Columbus, Ohio. This entry was posted in SOA Spring Conference on April 10, 2018 by Andrew Harris.